Whales Sing! 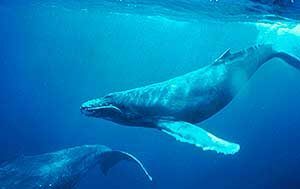 Scientists have discovered that humpback whales sing long, complex songs that can last up to 20 minutes and can be repeated continuously for hours! And, did you know? Pods of humpback whales from different geographical locations sing songs unique to their own population! Whale Acrobatics! Humpback whales are the most acrobatic of the great whales and often completely throw themselves out of the water, in an act called breaching. Scientists don’t fully understand why whales breach. Some think that it’s to remove parasites, others think it’s a visible form of communication; maybe, it’s just because it’s so much fun!? Humpbacks have the longest pectoral flippers proportionally of any cetacean, and they can often be seen slapping them on the ocean surface or waving them back and forth above the water! Scientists think that the humpbacks use their pectoral flippers to communicate with each other. Next time a humpback waves hello to you, be sure to wave back! Keeping an Eye Out! Another humpback whale behavior includes “spy-hopping”– lifting the head all the way out of the water to get a better view of the surroundings, and “tail lobbing” – raising its huge fluke out of the water and slapping it on the surface. Next time you’re out whale watching, keep track of how many different behaviors you witness and think about what the whale may be communicating.